Hi there! 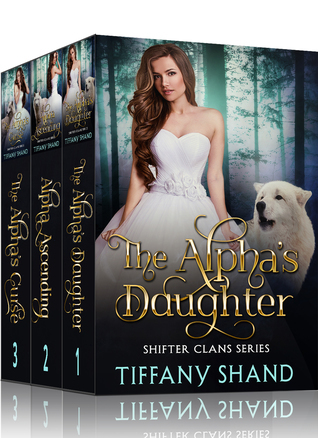 I am so excited to chat about the Shifter Clans series by Tiffany Shand. Because this is my Saturday Short Review, I will only be pointing out three things that I enjoyed about the book. However, if you are at all interested in reading it, I do suggest you do so! This series is comprised of three novellas and will not take you a long time to complete. It's perfect for the car ride on your way to your summer vacation! Start it out right! I received an eARC of this boxed set from the author in exchange for my honest and unbiased review. The complete series: The Alpha's Daughter, Alpha Ascending and The Alpha's Curse. 1. I loved Ronan! Not only is he one handsome gent, he is absolutely devoted to Christy. I typically find characters in novellas to be very under-developed. Ronan, however, was very well written. I enjoyed the spice and power he brought to this series. 2. I have an absolute love of all things fem power. Christy starts off this series as rather timid, but then grows up to be a foe no one would want to face. And, who expects a well-behaved "princess" to threaten to burn someone's balls off?! 3. I think it's really important to commend Shand on her wonderful world building. Too often, this gets neglected in novellas because the emphasis is placed on the story instead of the setting. However, Shand was able to combine the two and truly make a wonderful story. I hope to read a full-length novel by Shand in the future.